The Parish Centre is located across from the Church at 65 Green street. It’s open during office hours from Monday to Friday, 10 am until 4 pm. 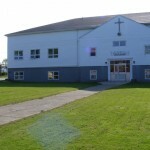 The Parish Centre has the parish offices, the bookstore, the library, the dining hall and kitchen, youth room and many classrooms.